What's so special about Sam Everington's Bromley-by-Bow health centre? Sam Everington isn't backwards in coming forwards. Back in the 1980s he made his name as a campaigning medical student, finding novel ways of highlighting the absurdly long hours that doctors then worked. He slept outside the Royal London Hospital, creating a media storm. These days you find Sam at his general practice, which attracts nationwide interest for the idiosyncratic ways in which he uses talented people in this deprived part of London's east end. He is also deputychair of the BMA, and a qualified barrister. In 1999 he received an OBE for services to inner city primary care, and in 2006 received the World Family Doctors (Wonca) Europe international award of excellence in health care. Recently I met Sam in Bromley-by-Bow. He welcomed me into his surgery and spent an afternoon showing me around his health centre. In addition to team members such as psychologists, nurses, counsellors, and phlebotomists, the centre also houses artists, stonemasons, gardeners, and stained-glass makers. I must say I never expected to find a communiversity and job centre based at a doctor's surgery. Locals get to hear about these health ventures through fliers, mail shots, and word of mouth. I asked about “The young at art” class advertised at the reception. Apparentlyit brings together patients for flower arranging classes. A lot of the group are elderly house-bound women with leg ulcers who have lost their self-esteem. This gives them a chance to meet others in a similar plight and have a fun afternoon in a congenial environment. The centre uses art therapy in line with the government's art and health policy. It's more than painting pictures. Art is used as a medium to express a patient's experience of their illness and the ways it affects them. 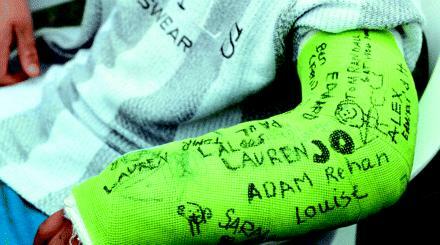 Patients with plaster casts are encouraged to draw pictures all over them. I also learnt about the annual diabetic fair. In the morning, participants are taken shopping to buy healthy ingredients, and they then return to the centre and make a tasty meal. Whole families come along to learn about diabetes. A tombola stand and a “ready steady cook” competition add extra interest. There's even an optician on site. What is remarkable is that this service is based on community, rather than doctors', needs. As Sam put it, “What can the patient do for the doctor?” GPs can make this dream come true by tapping into the best resource the NHS has—patients. Sam's strong belief in involving patients in their health care reflects a general movement to turn patients into experts. This is currently being promoted bythe BMA. It means encouraging patients to buy a sphygmomanometer, or advising them how to use the internet to research their illness. The more people you get involved in controlling their illness, the more everyone stands to gain. Sam has a holistic approach to health care. Education, employment, and creativity are all crucial in helping patients back on their feet. Children are part of the equation. Primary school children with asthma come in to draw pictures of airways and bronchi and they make models of common allergens, such as house dust mites. One of the children later stops Sam, “My peak flow has gone down by...,” and tells him he needs his medication changed. Sam is very interested in aesthetics. He believes that people feel and work better in a beautiful space. So a beautiful working environment can be a catalyst for improved performance. Furthermore, this centre belongs to the community, which is why they care about it. 90% of the local community visits here at least once a year, so almost everyone knows about it. The first thing former secretary of state for health John Reid said when he came to visit was, “Where's the NHS sign?” But Sam reminded him who the centre belongs to. This is their back garden and they take pains to look after it. Take Sam's friend Angela Lennox, a GP in Leicester. She realised that crime was a key health problem in her area. She liaised with her local constabulary and they set up a police office in the practice waiting room. The crime rate on the housing estate went down by 20%, which made a real difference to local residents' stress and anxiety levels, which were ruining their lives. Another colleague in the Oban area, on the west coast of Scotland, has a hairdresser in her surgery. Women in the area sometimes go to their hairdresser once a week; it's their priest, their guru, and their health adviser. You can imagine how such ventures connect with people and put them in touch with key health issues. Sam arranges guided tours of the practice. They're geared for GPs who want to set up similar projects and want to learn from his example. There's plenty to see in one day and you'll be certain to discover something that will relate to your own practice. Sam does not give false hope about setting up these projects. Not every project will be successful, though most will. Be a “can do” person. Don't give in to protracted committee planning. Doctors have the potential to be great entrepreneurs. They're switched on, and importantly, can do things their own way. You don't need to have a defined strategy but you do have to believe in your plans. Everyone has their own ideas about what they want to do with their practice. People will back you if you show enthusiasm. Find out your colleagues' interests and work together with them. It's not worth getting bogged down in finances. Ultimately, it pays to take risks. But the NHS is risk averse. People tend to worry about what people will say and think. They've got used to their way of doing things and resist change. How on earth can you deal effectively with health problems if you have preconceived ideas? Sam gives an example of this; his health authority came to discuss teenage pregnancy and offered the centre a doctor and a nurse. What they actually wanted was a street worker to go out and meet young people directly on the streets. But the health authorities wanted to stick with the status quo. A shared vision is absolutely crucial for success. But you don't have to be all the same; the doctors here are chalk and cheese. But you do need to be able to communicate effectively and get the best out of each other. The staff have lunch together in the “pie in the sky” café that serves delicious, healthy home-cooked food. It's a good idea to sit down and have lunch together. When friction occurs, it's easier to get over it. Everyone gets to speak their mind here so that they are not at odds with each other. You are going to email the following What's so special about Sam Everington's Bromley-by-Bow health centre?